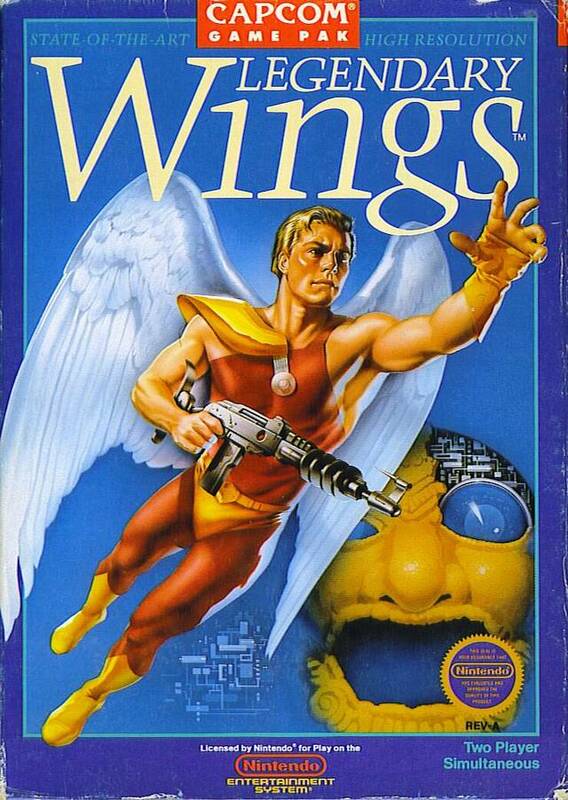 I’m very pleased to announce that my adaptation of the classic video game Legendary Wings has been selected for inclusion in the upcoming anthology The Lost Worlds of Power, edited by Philip J. Reed of Noiseless Chatter. My story will be one of twelve novelizations of games for the Nintendo Entertainment System™ written in, er, homage to the original Worlds of Power series, which often had little to do with the games that were being adapted. The anthology will be available as a free eBook when it’s done: I believe I’ll be able to host it here, but I will definitely include links if not. More information, including a release date, will be forthcoming as it develops. I’m very excited to be included, and I can’t wait to read the rest of the stories in the volume. The complete announcement can be found here. 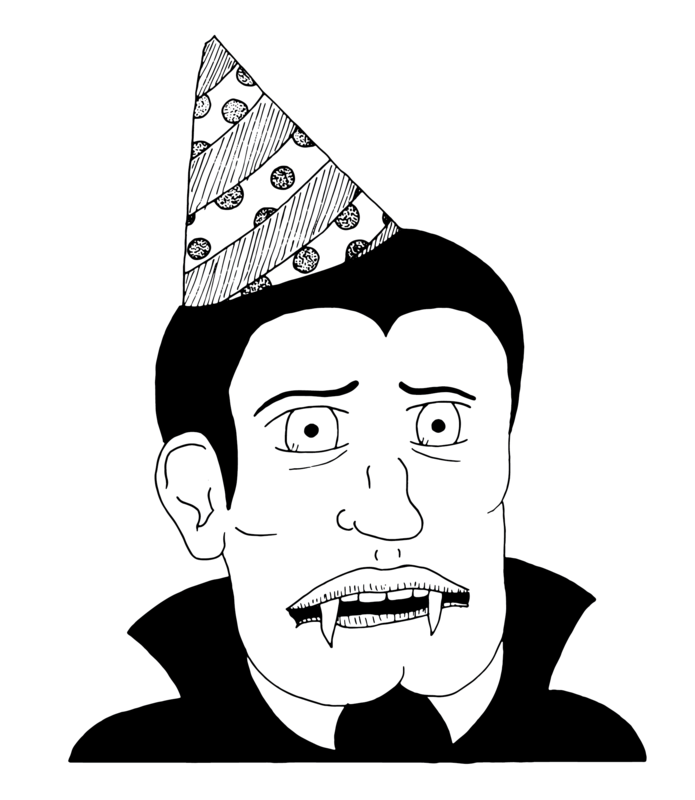 I saw The Lego Movie this weekend, and I loved it. This isn’t a review, and I won’t spoil anything, although I will direct you to Charlie Jane Anders’ review at io9 and its (accurate, in my view) contention that a successful genre spoof must authentically partake of the genre it sends up (in this case, the summer blockbuster and the hackneyed “chosen one” motif). Like all the recent movies based on beloved toys, The Lego Movie is at least partly pitched toward the nostalgia center of viewers’ brains. Sure, I played with Lego bricks as a child, and still enjoy them now that I have my own children to provide cover. 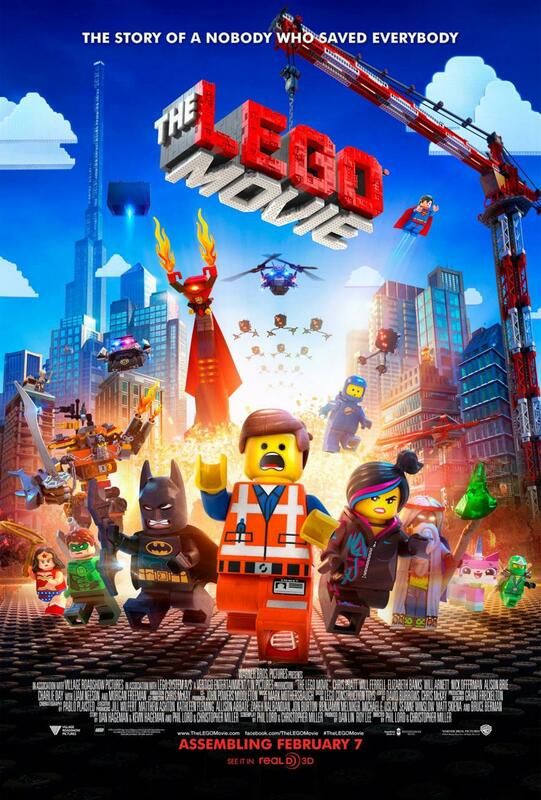 If that were all there were to it, however, I doubt I would have reacted so strongly to the film; the other Lego spin-off video games and cartoons I’ve seen are entertaining, but not profound. No, what I feel compelled to explore is how successful the film is at building an elaborate world out of familiar components, and its connection to the student films and music videos that did the same thing with toys when I was a kid. The idea of toys (or other inanimate objects) coming to life is hardly new, of course: before the Toy Story movies there was Corduroy and The Velveteen Rabbit and Raggedy Ann, back to the fantasies of E. T. A. Hoffmann and beyond. 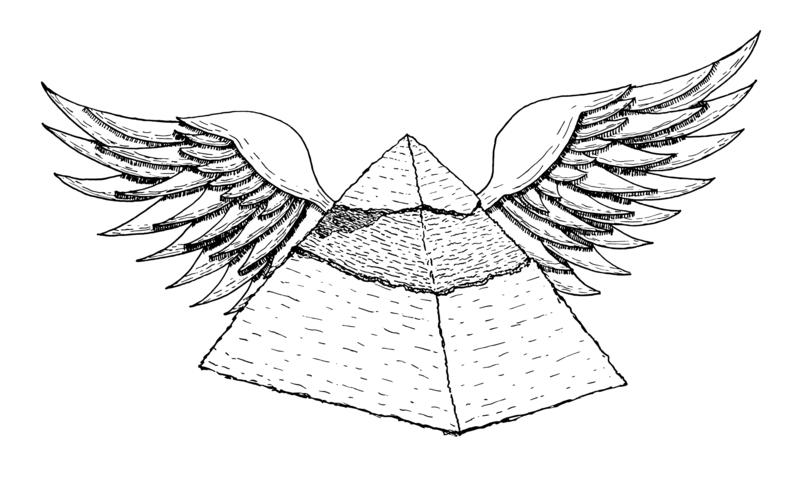 In all likelihood we could trace it all the way back to the idea of “household gods” and the pervasive spirits of pantheistic animism, or perhaps the unity of self and environment in earliest infancy. In any case, that’s not really my point; what connects my memory of playing with Lego bricks to the new movie (and makes it successful at driving its themes home) is the constructive nature of Lego: all imaginative play gives back only what you put into it, but Lego is explicitly open-ended. Since the first bricks were produced in 1949, every piece is part of a compatible system and can be connected together in some way. That’s the first prong of the movie: the pleasure of digging up and recombining the different “worlds” Lego has produced over the years (including some “deep cuts” like Fabuland). Obviously, there’s a lot more where that came from. What remains captivating about many of these little films is their handmade quality, and their use of everyday objects: toys, food, utensils. As with furnishing dollhouses, creating dioramas, or assembling Rube Goldberg-like marble slides (think of the game Mousetrap! ), there is an obvious pleasure in the handicraft involved in the creation of a tiny world, playing God on a child’s scale. When given the illusion of movement, it made it easy to imagine the ordinary objects I saw all the time having a secret life when I wasn’t around, both tapping into and feeding that sense of domestic enchantment alluded to above. It’s rough—I know I wouldn’t have been able to do any better at that age—but it has the same sense of play that the makers of The Lego Movie explore on a grand scale. Whatever you find weird, ugly, uncomfortable and nasty about a new medium will surely become its signature. CD distortion, the jitteriness of digital video, the crap sound of 8-bit—all these will be cherished and emulated as soon as they can be avoided. Eno was mostly speaking of audio formats, but his prescient words have also proven true for visual styles. 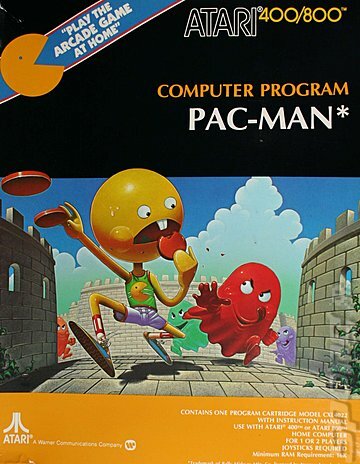 Eno mentions 8-bit sound; I think the abstraction Lego encouraged was a reason I was similarly fascinated with the blocky graphics of the the video games that emerged in the late 1970s; just as with the stop motion videos that appeared to bring Lego bricks or candy to life, Space Invaders and Pong gave movement—controlled by the player!—to simple, even primal, geometric shapes. I was so fascinated by this level of abstraction that I would practice breaking down pictures into their component pixels using graph paper. I even briefly took up cross-stitching because it looked to me like video game graphics; the only tangible proof of that brief flirtation that I left behind was a sample sheet with a few segments of the Centipede from the game of the same name, rendered in cross-stitch. 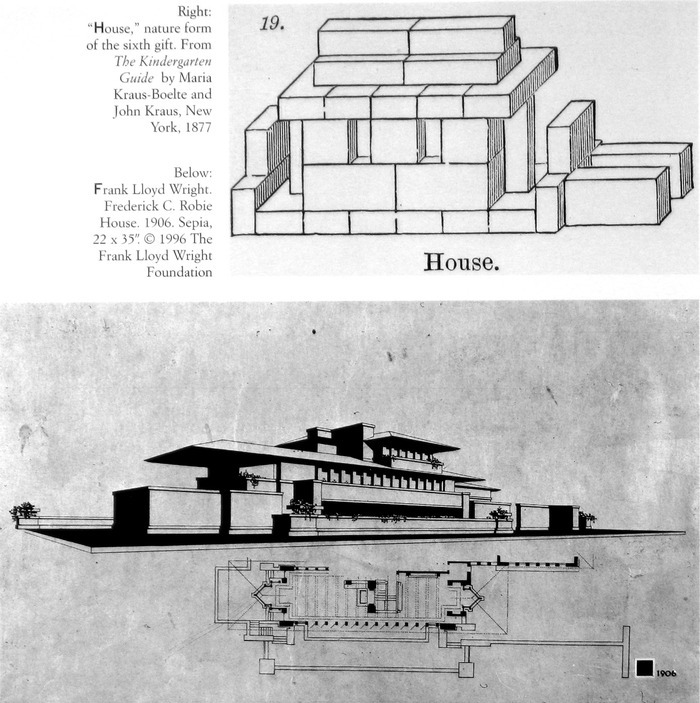 During the system’s heyday—roughly the half century before World War I—Frank Lloyd Wright was merely one of millions of people, including most of the so-called “form-givers” of the modern era who were indoctrinated, in effect, programmed, by the spiritual geometry of the early kindergarten. Brosterman’s book is full of pictures juxtaposing nineteenth-century kindergarten projects made by small children with artwork made by adults of the same generation years later. The comparisons are suggestive, to say the very least. The gift gives the child a new cosmos, the occupation fixes the impressions made by the gift. The gift invites only arranging activities; the occupation invites also controlling, modifying, transforming, creating activities. The gift leads to discovery; the occupation, to invention. The gift gives insight; the occupation, power. Without wishing to overstate the case, Lego bricks descend from the same progressive concept of early childhood development as a process of discovery and mastery, and lend themselves to a similar kind of abstraction of the real world. Interestingly, the debt Wright and other modernists owe to Froebel’s kindergarten, as described by Brosterman, has not been lost on modern educators and toy makers (in this context “toy” may sound dismissive, but it’s relevant: Milton Bradley, for example, was an important U. S. maker of Froebel gifts). Froebel USA now makes a “Prairie House Block Set” of abstract building blocks, both a tribute to the credit Wright gave to the Froebel system and, in all likelihood, an appeal to parents who might hope for a similar start for their own children. 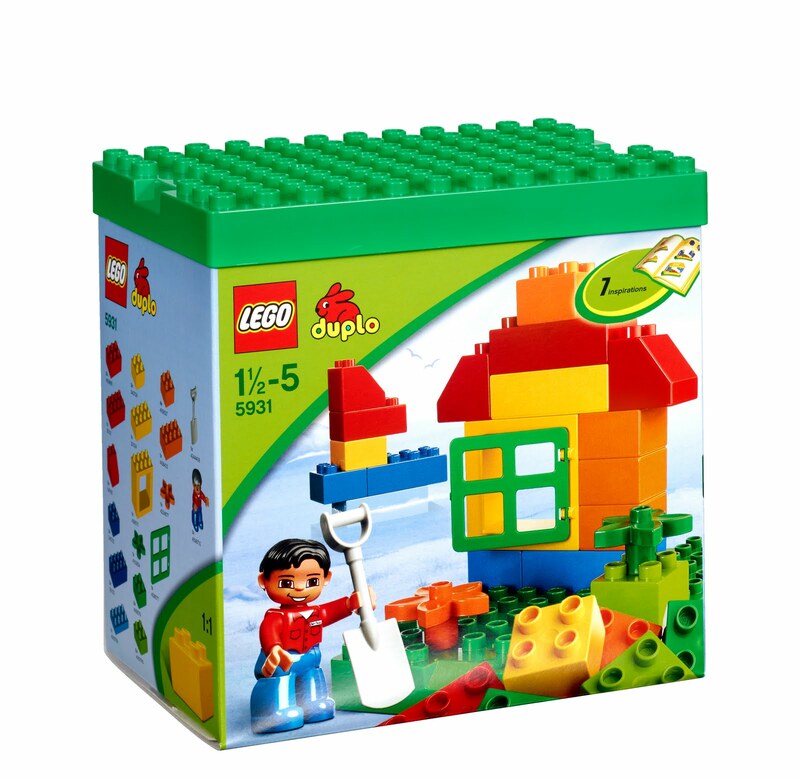 And while Lego has expanded its original system of interlocking blocks to include very young children with its Duplo blocks, it’s also moved in the other direction with its “Architecture” line aimed at teenage and adult model-builders. 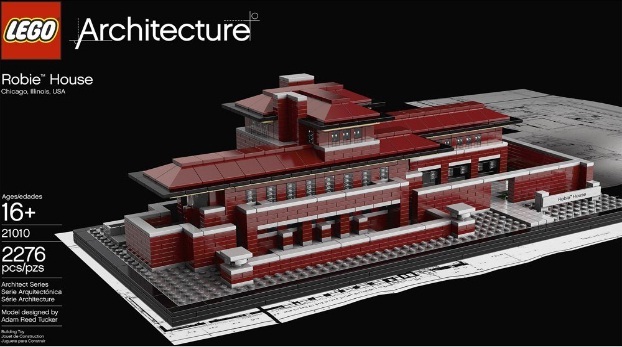 Detailed Lego versions of real-life architectural masterpieces, including some by Frank Lloyd Wright, are available as kits. (Here’s a more detailed description of the Prairie-style Robie House model shown below.) With the Architecture line, the emphasis is on faithful recreation, but the pieces are just as compatible with the Lego system as any other. That’s the beauty of it: whether following the instructions or building freely, it’s all up to you. That’s a core component of Lego that The Lego Movie gets.